The final step in the work with seismic data is seismic interpretation. In a scientific field called geophysics, interpretation sounds highly subjective; Very different from the usual statistics, ray and wave phenomenae. This can’t be right, right? I’d love to say it’s very clear and seismic data reveals a perfect image of the subsurface. But it really doesn’t. Any way we manipulate seismic data has one single purpose, revert the filtering effect of the subsurface on our data. Thinking about all the steps we undertake to clean up our image I am sometimes amazed we can find anything with seismic data at all. In the end we may be left with something along the lines of this image. 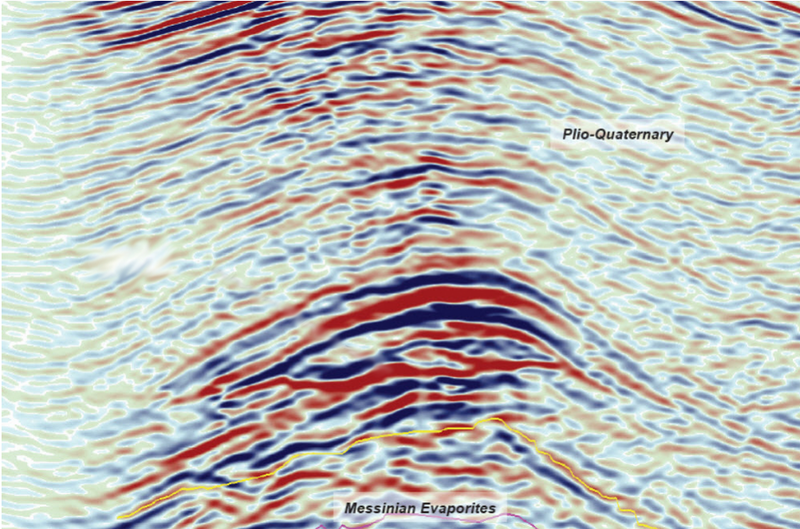 This seismic image is quite good looking. We have low noise levels and pretty good contrasts. We can even see some hydrocarbons on here! At least when you know what you’re looking at. The upper unit is made up of Pliocene sediments. They’re neatly stacked, which usually indicated some sort of marine deposition regime. Below that is where the magic happens. We see some strong contrasts in a rounded structure. The rounded structure consists of evaporites, which are essentially salt, gypsum or anhydrites. A rounded structure like that is called an anticline and is pretty awesome for the hydrocarbon industry as oil and gas tend to get trapped there and build a reservoir. Within this anticline structure we see something that doesn’t work geologically. There are two lines crossing. The anticline crosses an almost horizontal line. This indicates that there has to be something else causing this image. These so-called flat spots can be an indicator for a hydrocarbon trap as the fluid in the sediments changes the reflection schematic. Now the really interesting piece is, that you very probably able to follow this explanation of the flat spot, but there’s a good chance we weren’t looking at the same flat structure. Seismic interpreters looking at the same image will interpret it in different ways. The following image shows how 39 different interpreters took the challenge, generated into a heatmap. We can explain these phenomenae scientifically, but finding them is still highly subjective. We can see that the heatmap shows many picks along the flat spot I described. This is especially interesting as I posed the challenge to pick the “hydrocarbon indication” instead of directly giving out the challenge “find the flat spot”, giving us many more interpretations. 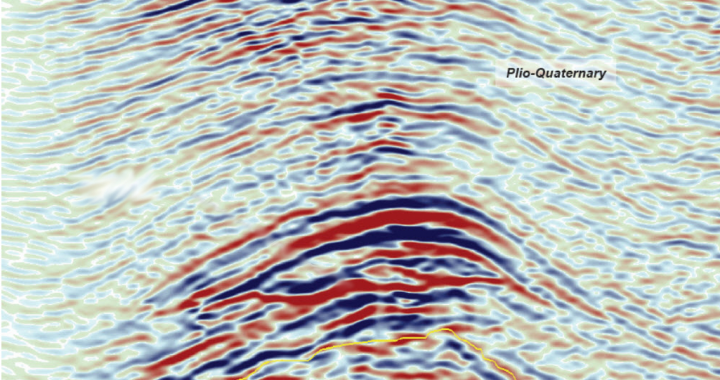 This is an image taken from the webapp pickthis.io, which was initially started at the geophysics hackathon in Denver, accompanying the SEG. It let’s you take some simple interpretation challenges and you can then compare and vote on other interpretations. Personally, I think this is brilliant practice time before there is actually money to be lost with wrong interpretations. You can also contribute to it via github. I just implemented a new tagging feature. What do you think? Is this good practice or a waste of time? There’s definitely value in having multiple interpretations of a single dataset. 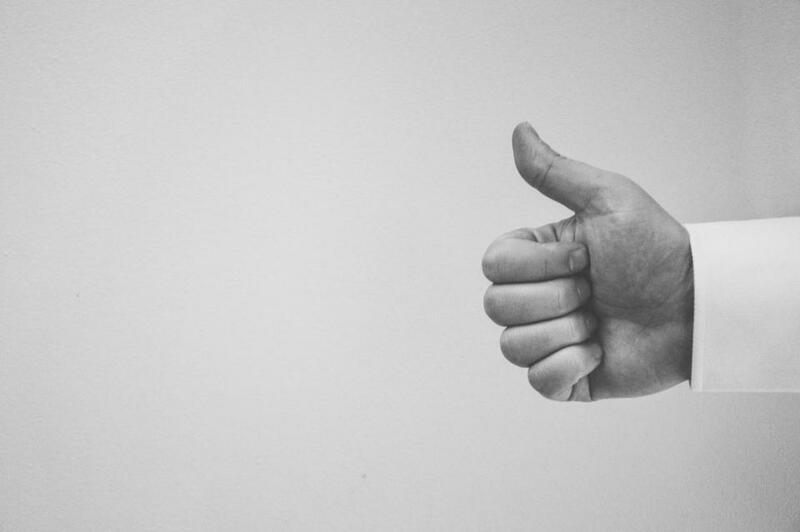 I saw a great presentation years ago where the oil company had three interpreters work independently on a project, and told them to pick “optimistic” and “pessimistic” answers. 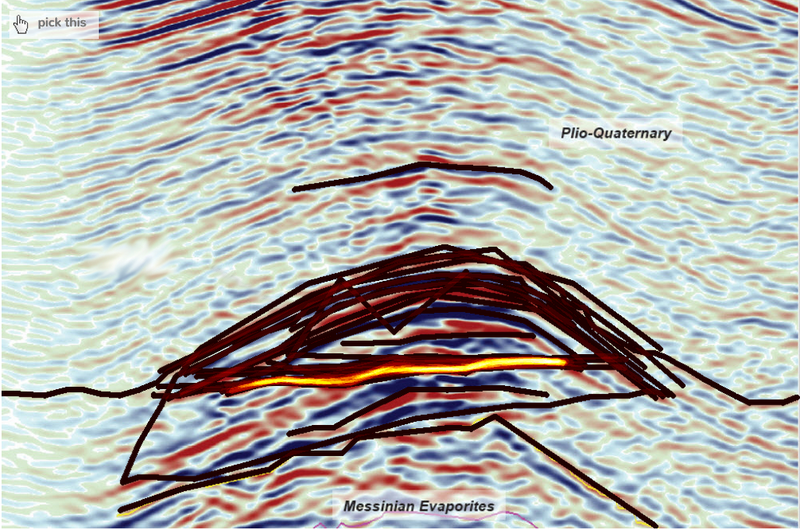 They got better results, and faster, because no one waste time trying to get the “One True Interpretation” – and they got a nice probabilistic model for drilling targets as it ensured that any “uncertainty” was carried right though the whole process. Error bars rock! HOWEVER – at this point I think there’s more “art” than “science” going on here. With just a limited snapshot of one 2D seismic profile a lot of the contextual things we could use to be more quantitative are missing. This removes the “science” aspect somewhat. First thing for me (always) is acquisition and processing, so I can get an opinion about the wavelet and phase. Next thing is the broad structural and stratigraphic context – big picture stuff like major faults and so on – stepping across multiple lines. It’s worth thinking about how the “old school” paper and pencil geophysicists did this. For a start, they had a side-label with the complete acquisition and processing history. Then they had a top label, with the fold, elevation and statics. They also usually had “velocity boxes”, with time, depth and interval velocities on them. They also has all of the line-tie and intersection points marked on top. The “old school” geophysicists (who were, of course, not just interpreters) also had a saying – a “one line wonder”; this was when a junior geo would interpret some glitch – out of plane energy, processing artefact etc – as a direct hydrocarbon indicator, and then explain away why the same signal wasn’t seen elsewhere….